There are currently a number of hair-loss products and treatments available and you can find out more about the various options currently available at sites like Hair Growth Helper. Men are particularly susceptible to baldness and by the time you reach your 50th birthday if you are a man, you have an equal chance of being in the 50% figure displaying signs of male pattern baldness. Scientists based at the Sanford-Burnham Medical Research Institute in California are cautiously optimistic that they may have been able to find a reliable way of growing new hair using human stem cells. Previous research has identified that the creation of dermal papilla cells is critical to follicle creation but previous attempts to develop a reliable system have been thwarted due to the fact dermal papillae lose their effectiveness when you attempt to multiply them. The latest research has discovered that producing the papillae from stem cells gets around this issue and if tests continue to produce positive results, we could be looking at a technique that provides an unlimited source of cells and a potential cure for baldness. Before anyone gets too carried away and starts preparing for a head of hair that they have not had for some time, it is fair to say that whilst the tests are encouraging, it is definitely still early days. Bizarrely, the current test involve causing hair follicles to appear on grafts made from the foreskin of infant mice, which don’t have any hair follicles in the first place. Tests were able to produce hair follicles to appear on their foreskin hides in five out of seven cases but the concerns to date are the fact that they didn’t manage to sprout hair strong enough to grow beyond the skins surface. There are undoubtedly some jokes out there waiting to happen if they develop a cure for baldness using mice foreskin to test its effectiveness, but there are not many patients who would care about that if they are offered the chance to grow a head of hair again. Whilst some scientists are still search for the defining key that unlocks a confirmed cure for baldness, there are some who are looking at options that involve natural remedies. One natural remedy that has been making some headlines is a proposed cure for baldness which involves a herbal concoction of fenugreek and saw palmetto. Fenugreek is renowned for its ability to increase the dilation of blood vessels and this is helpful in delivering more blood and nutrients to the scalp. Combined with saw palmetto, which is not dissimilar to the prescription drug Finasteride, scientists have produced a recipe that is claimed to be able to control male hormone-related hair loss. The scientists working on this treatment are based in Finland and they claim to have refined the recipe so that they can produce a capsule which patients can take. A limited trial has been carried out at the Helsinki Trichological Institute and the Hairfood they used on the patients did show signs of substantial hair regrowth on their crowns and other areas of regrowth. Despite the optimism taken from these limited test results so far, the Institute of Trichologists itself, is not so convinced that there Finnish counterparts have produced a viable solution. 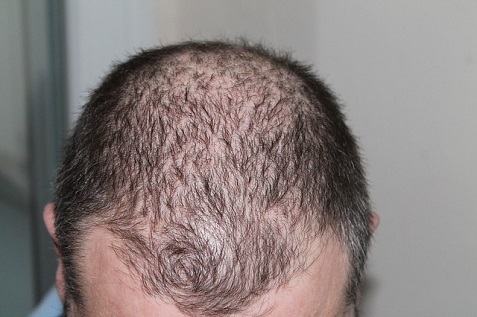 They claim that it is unrealistic to expect baldness to disappear within six months because it definitely takes longer than that to generate substantial growth, so again cautious optimism is required. As you would expect with such a large potential market, there are numerous treatments being offered by manufacturers and there are a number of non-prescription options that can deliver similar results to prescription medicines, but without any side-effects attached. Sephren is a supplement and topical foam which is intended for women only whilst Procerin is intended for male use only. Sephren is a herbal supplement that encourages hair pigment and Procerin is a tablet that consists of natural herbs, vitamins and minerals. These are just a few of the non-prescription treatments available and it has to be remembered that hair loss affects people in different ways, so what works for one person may not be so effective for someone else. If they find a cure as promised at some time in the future, it will hopefully be suitable for everyone who is suffering from baldness. Jonathan Hadley works at a hair salon. He enjoys sharing his insights on grooming and hair care. His articles appear mostly on men’s living websites.